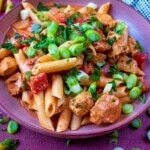 Pasta is so versatile! 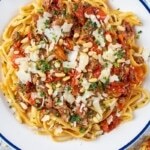 There is so much you can do with a pasta and so many sauces you can add. 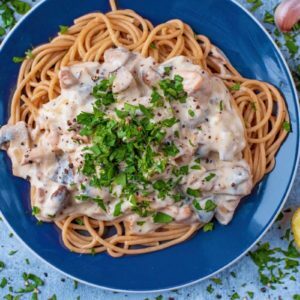 From Mushroom Bolognese to Prawn Spaghetti to our incredible Leftover Pasta Bake and many more, find the perfect pasta recipe to rival any Italian restaurant! Start putting some adventure back into your meals with our awesome pasta recipes! 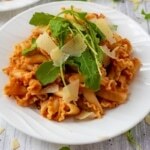 A sausage pasta bake is a delicious comforting dish that is perfect for batch cooking and freezing. Easy to adapt and add lots of vegetables to, it’s a simple weeknight meal that the whole family will love. 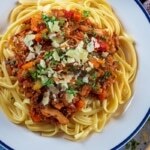 Use any kind of pasta, any kind of sausage (even meat free), and any veg you have that needs using up. 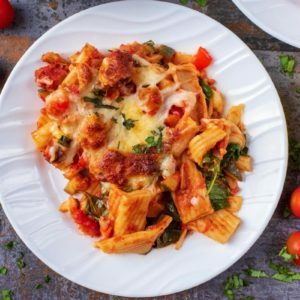 It doesn’t get much more comforting than a creamy pasta bake and this Creamy Tomato and Chicken Pasta Bake is an easy weeknight meal that will feed a hungry family of 4, or 2 with leftovers to take to work. 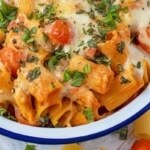 A creamy tomato sauce with chunks of chicken, and plenty of cheese of course! Sweet and juicy roasted tomatoes stirred through garlic herb spaghetti and mixed with Parma Ham is such a simple and classic pasta dish. Roast the tomatoes ahead of time and then heat them up with the spaghetti when you are ready to eat it – this pasta with tomatoes and basil is an easy weeknight meal. Pasta salads are a must at a BBQ or picnic. Don’t get stuck in a rut when it comes to them – make this vegetable packed Greek Pasta Salad that’s a real crowd pleaser, so easy to make and basically summer in a bowl. 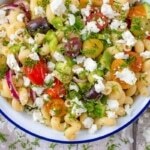 Chunky pasta, a zesty dressing and plenty of feta and olives….